A camera’s vision is not quite like ours. As a photographer you need to see the world as a camera see it. One of the differences is that the eye focuses constantly, and we see everything in focus from near too far. With a small aperture selection like f22 and a wide-angle lens, you can almost get the focus of the human eye, where everything is sharp and in focus. This focusing is good for landscape photography, where you usually want to see all elements of an image sharp from foreground to background. Another way is to use selective focus: emphasizing a particular part of an image, making the subject of the image stand out; singing its visual song. This is a powerful technique to draw the viewer’s eye to the subject, where the photographer wants the viewer’s eye to go. The eye is drawn to the sharp focused subject surrounded by the blur area containing the rest of the image. This seeing is as the camera sees not as the human eye sees. Controlling the aperture size is the key to controlling the depth of field and selecting the focus area–what’s sharp and not sharp within the image. Here is an example of selective focus; I entered this image in my camera club recently. This cheetah image was taken at the San Diego Wild Animal Park. 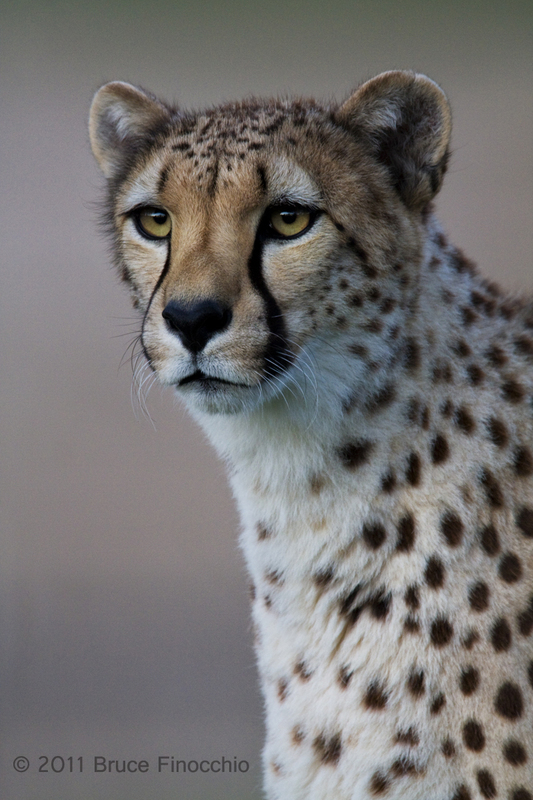 I did not use a small aperture like f22 to render the whole portrait of the cheetah sharp. I used instead an aperture of f5.6, so my depth of field with my 600 mm lens and with 1.4 tele converter was shallow, leaving the neck and parts of the shoulder slightly soft. This makes the alert cheetah’s face and eyes seem very sharp, more so because the rest of the body is slightly soft. The story and impact of the image is the face, the alert expression, and those penetrating eyes. Penetrating eyes that look into the soul of the animal! With selective focus, these features are emphasized to the viewer. Subtle in its effect, but nonetheless greatly contributes to the overall success of the image. Also, it should be noted that this image was taken after sunset late in the evening, so I needed to use a large aperture and a high ISO of 800, just to obtain the proper exposure… My camera was on a tripod and with the animal not moving; I had a choice of using a sharper aperture, and slower shutter speed. My goal for the image was to focus on the face and the great intense stare. Choosing an aperture with a small and shallower depth of field gave me the critical focus on the face, very slightly blurring the neck and shoulders, making the face really stand out and sing. Why not make the neck blurrier? That would make the face stand out more. I think if you did that; it would make a face on a blurry body (a post it or cut out look), and the blurriness would attract the eye and away from the face you want the viewer to see. A completely burly neck doesn’t work well for this type of animal portrait. Why not make the image completely sharp? Well, yes, for a nature interpretation, you might want a completely sharp image. I believe this makes the image more a record shot, rather than an artistic presentation. This selective focus technique is used a lot in macro photography, flower photography, and many other types of image making as well. The uses are endless, so make sure you apply this technique to your photography. What a great article! You’ve got my imagination wheels spinning now! Never really considered the fact that our eye focus is always changing…Thanks for the tips! Thanks Dan! Selective focus can real make a subject stand out. You’re right the possibilities are endless and up to the photographer’s imagination. Every photographer’s vision is different, seeing the visual world uniquely, and that’s one thing that makes photography exciting. Beautiful shot and good explanation. Previous Previous post: What type of images sell? What do customers want?